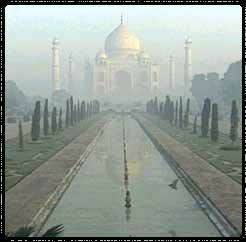 Tajmahal History - Info on story of a monument of eternal love. The origin of the name "Taj Mahal" is not clear. Court histories from Shah Jehan's reign only call it the rauza (tomb) of Mumtaz Mahal. It is generally believed that "Taj Mahal" (usually translated as either "Crown Palace" or "Crown of the Palace") is an abbreviated version of her name, Mumtaz Mahal.